By the authority vested in me as President by the Constitution and the laws of the United States of America, and to assist faith-based and other organizations in their efforts to strengthen the institutions of civil society and American families and communities, it is hereby ordered as follows:d community organizations have tremendous ability to serve individuals, families, and communities through means that are different from those of government and with capacity that often exceeds that of government. These organizations lift people up, keep families strong, and solve problems at the local level. 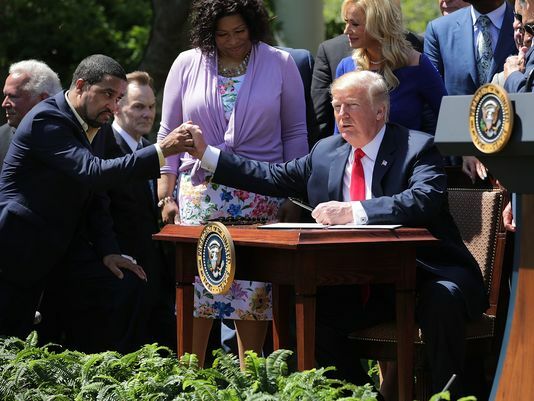 The executive branch wants faith-based and community organizations, to the fullest opportunity permitted by law, to compete on a level playing field for grants, contracts, programs, and other Federal funding opportunities. The efforts of faith-based and community organizations are essential to revitalizing communities, and the Federal Government welcomes opportunities to partner with such organizations through innovative, measurable, and outcome-driven initiatives. This entry was posted in Government, Religion, Uncategorized. Bookmark the permalink. If my faulty recall isn’t all that faulty I do believe that Reublican presidents regularly release proclaimations based on faith and religious morals while Democratic ones just go and break various Commandments and advance amorality and secularism. OK, there was Carter but the DNC doesn’t invite him to parties. Yeah, but he’s the only Rat president I can remember who even comes close to ‘moral’. Voters gave him a good dressing down in ’80 though.